The Ténéré wastelands of northeastern Niger were once populated by a forest of trees. By the 20th century, desertification had wiped out all but one solitary acacia. 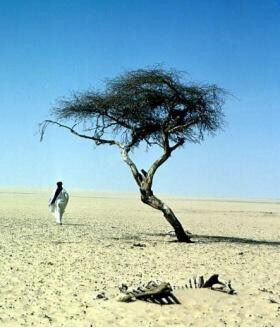 The Tree of Ténéré, as it came to be called, sat alone on the landscape for 400 kilometers in every direction. Its roots reached nearly 40 meters deep into the sand. That’s over 131 feet. Which is almost half the length of a football field. This is how one single tree has survived the elements – it’s through deep roots, stretched down to find water. These roots stretched down so far, in fact, that this tree was able to survive even when nothing else has. You would assume that trees like this, which can grow to be over 350 feet tall, would have roots that extend at least as deep as the acacia, if not much deeper. 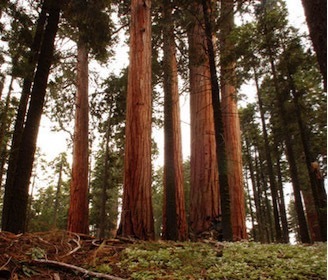 But Redwood tree roots are actually very shallow, usually only 5 or 6 feet deep. But while they do not go deep, they certainly go wide, extending up to 100 feet from the trunk. What’s more, these roots intertwine and sometimes even fuse together with other Redwood roots. That’s how these trees have survived the elements – it’s through banding together so that when the wind and rain comes, the combined strength of the grove is brought to bear in their defense. These are two different kinds of trees, two different kinds of roots, and both teach us something about the nature of abiding in Christ. If we are to abide in Christ, we must be progressively moving deeper. We must be diligent and disciplined in things like prayer, Scripture, fasting and others, and through these spiritual disciplines, we put ourselves in a position to be surrendered to the transformative work of the Holy Spirit in our lives. It is through our time and devotion, driven by faith, that we grow deep. “The man who trusts in mankind, who makes human flesh his strength and turns his heart from the LORD is cursed. He will be like a juniper in the Arabah; he cannot see when good comes but dwells in the parched places in the wilderness, in a salt land where no one lives. The man who trusts in the LORD, whose confidence indeed is the LORD, is blessed. He will be like a tree planted by water: it sends its roots out toward a stream, it doesn’t fear when heat comes, and its foliage remains green. It will not worry in a year of drought or cease producing fruit” (Jeremiah 17:5-8). At the same time, God has given us the gift of each other. When we abide in Christ, it’s true that we do so at a very personal level, but we are not meant to abide there alone. We are meant, through the fellowship of the saints in the church, to strengthen one another, to encourage one another, to rebuke one another, and to bear one another along to Jesus. Through the church, we are able to abide with Jesus. “Let us hold on to the confession of our hope without wavering, for He who promised is faithful. And let us be concerned about one another in order to promote love and good works, not staying away from our worship meetings, as some habitually do, but encouraging each other, and all the more as you see the day drawing near” (Hebrews 10:23-25). Grow deep, Christian. Plumb the depths of God, and find that there is eternally more to plumb. But do not grow deep alone. Accept the gift of the church and intertwine your life with others as you abide together.